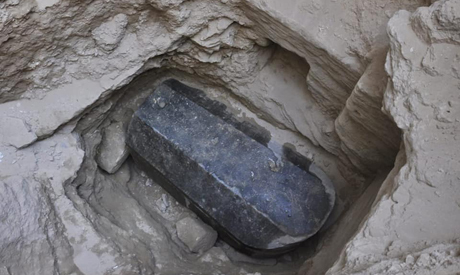 A sealed black granite sarcophagus, uncovered by chance in Alexandria, has triggered people's imagination the world over, particularly on social media. The story of the sarcophagus started earlier this month when archaeologists stumbled upon it during an inspection excavation carried out on privately owned land in Sidi Gaber area in Alexandria. According to Egyptian law, any land that is to undergo construction must be archaeologically excavated and inspected by a mission from the Ministry of Antiquities before the laying down of foundations. The sarcophagus is carved out of black granite, 1.85 metres tall, 2.65 metres long, and 1.65 metres wide, and is without inscriptions that traditionally would describe its owner. It has remain sealed since antiquity. The mystery as to its contents has captured attention and led to much speculation. The sarcophagus has made headlines in several international and local newspapers and TV channels. The film “The Mummy” has been frequently referenced, satirically, as a warning of what might go wrong when sealed ancient Egyptian tombs are opened. Some claim that the sarcophagus belongs to Alexander the Great whose tomb was never found. Others speculate taht the sarcophagus houses the secret of the Pharaohs’ curse and warn Egypt not to open it because upon its opening Egypt and the whole world would fall into the curse and stay in darkness for a thousand years. Still others claim that the sarcophagus belongs to an ancient Egyptian royal, and it is full of funerary gold. “The Ministry of Antiquities’ press office and I have received thousands calls from international and local media about this, all day along, in the last week,” Mostafa Waziri, secretary-general of the Supreme Council of Antiquities, told Ahram Online. Waziri said that claims that the sarcophagus might contain the mummy of Alexander the Great or Queen Cleopatra, or the New Kingdom's King Ramses II, are unfounded and far fetched. Waziri told Ahram Online that it is better if people stop guessing and that archaeologists would open the sarcophagus within days. He also wondered why this sarcophagus has capture attention, though most of the discovered stone sarcophagi are sealed and intact, and are more luxurious and elegant than the one found in Alexandria. Last Saturday, Waziri said, five intact and sealed stone sarcophagi were found in Saqqara necropolis, along with a mummification workshop, and when one was opened nothing happened; no curse, and the world did not fall into darkness as some claim will happen. Egyptologist and former Minister of Antiquities Zahi Hawass told Ahram Online that the sarcophagus does not belong to Alexander the Great, or a Ptolemaic or Roman royal, because it was found outside the Roman royal area. Nonetheless, he suggested, it belongs to someone important and wealthy, as it is carved in black granite brought from Aswan. “For someone to bring granite from Aswan, located more than a thousand kilometres away, means the owner of the sarcophagus would have been rich,” Hawass said. Hawass told Ahram Online that for hundreds of years, several failed attempts were made by archaeologists and explorers to locate the tomb of Alexander the Great, believed by many to have been buried in Alexandria. The first failed attempt was made by a Greek restaurant waiter named Stello who tried to find it in Mahatet Al-Ramel area in Alexandria, while late archeologist Fawzi Al-Fakharani believed that Alexander was buried in Al-Shatbi area. Other claimed he was buried in Al-Nabi Daniel area, in Downtown Alexandria. "The dream of finding Alexander the Great's tomb is overwhelming people. That is why I called the Ministry of Antiquties to hurry up and open the sarcophagus as soon as possible, to put an end to such a dream and suggestions," Hawass told Ahram Online. Hawass believes that if the sarcophagus is intact it could only house a mummy. Else it would be empty, previously robbed by tomb raiders.